7.9 acres, Privacy, Acreage, Beach access, Private Golf, Impressive Grounds, with outdoor areas ideal for entertaining or simply relax in this mature setting. Enjoy the recently built 18’X48′ pool and pool Cabana or practice your golf swing from 5 different tee areas from 160 yards. 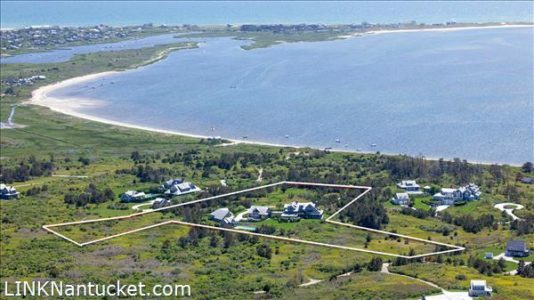 The 5+ bedroom main house has large open common rooms that are filled with light, multiple fireplaces, with views over the moors to Nantucket Sound. Out buildings include two 3 car garages, one has a loft apartment, Large storage areas above that can developed for more living space. It’s a short walk to Warren’s Landing beach and boat moorings or Eel Point beaches for fishing and swimming. Lots of expansion potential. This is a must see, and the value is unbeatable. Lower Level Finished basement with huge open office and game room area, additional laundry and storage rooms. MAGICAL SETTING! A charming Salt Box design home surrounded by native plants sits high on a private one acre parcel. ..
A beautiful and serene one acre parcel with a well maintained and nicely updated three bedroom two bath home. This ..